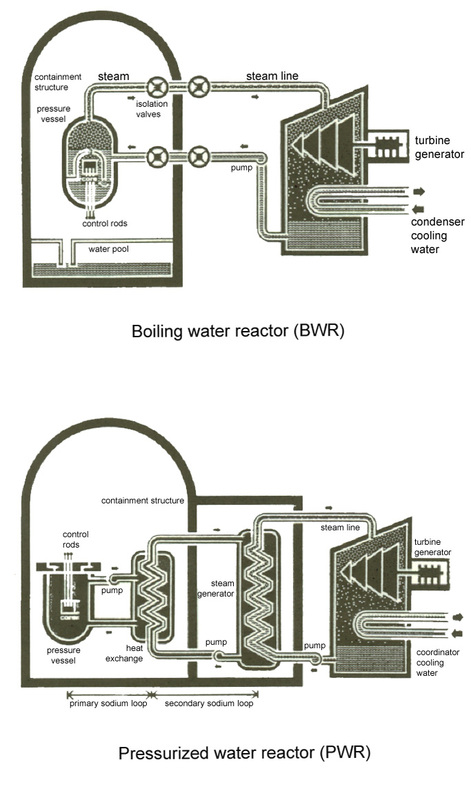 BOILING WATER REACTOR (BWR). As with the boiler in a coal-, oil- or gas-burning power plant, a nuclear power reactor produces steam to drive a turbine which turns and electric generator. Instead of burning fossil fuel, a reactor fissions nuclear fuel to produce heat to make the steam. The BWR shown here is a type of reactor fueled by slightly enriched uranium in the form of uranium oxide pellets held in zirconium allow tubes in the core. Water is pumped through the core, boils, and produces steam that is piped to the turbine. General Electric Co. makes BWRs. PRESSURIZED WATER REACTOR (PWR). As with the boiler in a coal-, oil- or gas-burning power plant, a nuclear power reactor produces steam to drive a turbine which turns an electric generator. Instead of burning fossil fuel, a reactor fissions nuclear fuel to produce heat to make the steam. The PWR shown here is a type of reactor fueled by slightly enriched uranium in the form of uranium oxide pellets held in zirconium alloy tubes in the core. Water is pumped through the core to transfer heat to the steam generator. This coolant water is kept under pressure in the core to prevent boiling and transfers heat to the water in the steam generator to make the steam. Three U.S. companies manufacture PWRs: Westinghouse Electric Corp., Combustion Engineering, Inc., and The Babcock & Wilcox Co. 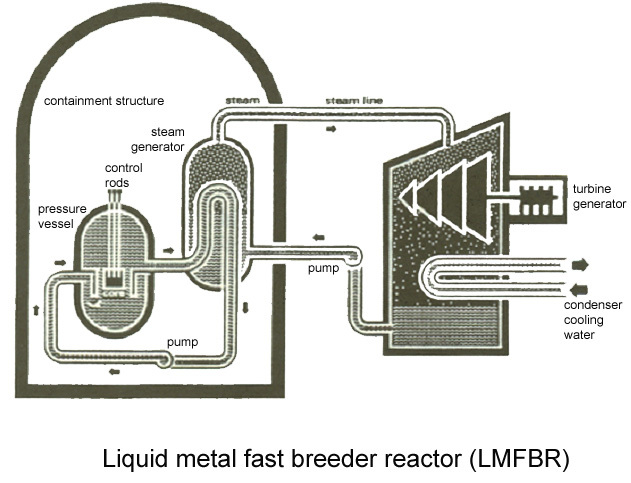 LIQUID METAL FAST BREEDER REACTOR (LMFBR). As with the boiler in a coal-, oil- or gas-burning power plant, a nuclear reactor produces steam to drive a turbine which turns an electric generator. Instead of burning a fossil fuel to make heat, the reactor fissions nuclear fuel to make the steam. In an LMFBR, molten sodium in the primary loop is pumped through the reactor core containing the fuel. This sodium collects the heat and transfers it to a secondary sodium loop in the heat exchanger, from which it is carried to the steam generator. In addition to producing electricity, this type of reactor also produces more fissionable material than it consumes, which is why it is called a "breeder reactor." When irradiated, certain non-fissionable materials may be transformed into material that is fissionable. An LMFBR begins operation with a core of fissionable uranium-235 surrounded by non-fissionable uranium-238. During operation, the U-238 is bombarded by high-velocity neutrons and transmuted to fissionable plutonium-239. The plutonium is extracted periodically and fabricated into new fuel. The country's first commercial LMFBR demonstration plant, designed by Westinghouse Electric Corp., is being built in Tennessee by Commonwealth Edison Co., the Tennessee Valley Authority, and the Atomic Energy Commission.